As we grow, change, and evolve, what we used to enjoy may not cut it for us anymore. When you first began working in your profession, you probably loved your job. But fast forward to now, and you may no longer experience the fulfillment you used to. The loving feeling is gone, and you want to go down a different road. How can you start anew later in life and compete in a new sector? How can you revamp yourself and start over again? What may seem like an arduous task doesn’t have to be. Yes, you will have to put in grind time and earn your stripes, but it is not to late to create a new professional persona. Career reinvention is totally possible and isn’t as hard as you may think it is. You need a few simple key ingredients to change course and work on something that you are passionate about. 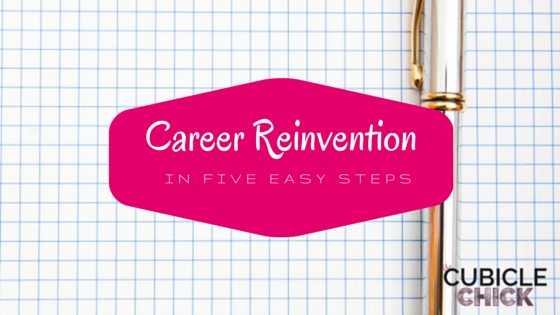 I’ve got for you a list: Career Reinvention in Five Easy Steps. And it’s a blueprint towards your professional happiness. 1. What Would You Do If You Weren’t Afraid? This is the question you must ask yourself before you take the leap to changing careers. Weigh the pros and cons. Being honest with yourself before jumping the gun is best, and can prepare you for uncertainty. You also must make sure that you are switching careers, not because it’s the latest soup de jour, but because you would be personally and professionally fulfilled in this new role. Make sure you are changes paths for the right reason. Reinventing oneself takes time. Rome was not built in a day and neither is your newfound career. If you are trying something totally new, you will have to get your feet wet. While you are still working at your current job, begin to nurture your new career choice. Take classes and educate yourself so that you are prepared (think online courses and continuing education). Do your due diligence and research. Write out the pros and cons and be honest with yourself. Network with others in the field you are interested in and get a mentor who can help teach you the ropes. Be open to learning and to change. You are older this go around, so you may be competing against younger people in your niche. The best way to get some experience and work under your belt when switching careers is to work for free. Again, you probably want to do this while you are still working so that the bills are still being paid and you are getting your feet wet. Work as an intern and get hands-on experience. You can also offer your services through barter or trading or even pro bono to build your resume and your portfolio. Don’t let your ego get in the way of starting your way at the bottom and working your way up. I consulted a 50+ year old woman two years ago through her career change from a financial planner to being a chef. She had to start working in the kitchen of a popular upscale restaurant as a line cook. Then she went to a sous chef, and then onto a head chef position. She wasn’t happy working on the line, but this is wear she earned the respect of her colleagues. Because she was willing to literally start at the bottom, she proved that she was a team player. That alongside her training at Le Cordon Bleu helped her career reinvention. We all would love a happy ending like described above, but in reality, that may not happen. Have a Plan B and C just in case, and be prepared to use it if it doesn’t work out. Make sure to leave your previous professional with an impeccable record, and don’t burn bridges. Develop a plan and a strategy to help you when and if the going gets rough. I am a believer that hard work trumps all. No matter if you are starting a new career, reinventing yourself, or getting out into the job field for the first time after raising your children. If you are dedicated, have a stellar work ethic, and do the work, you will be successful at whatever you choose. You have everything you need to be a success right inside of you. Make sure to have a support system in place to lean on and encourage you. Career reinvention is achievable. No longer do you have to be beholden to a job that no longer gives you satisfaction. You can switch gears and create a new professional chapter if that is your desire. It’s never too late.